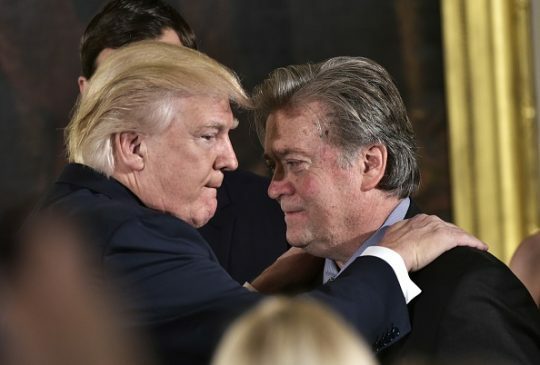 President Donald Trump said Thursday that the new tell-all book about his White House is "full of lies" and bestowed one of his famed nicknames on former chief strategist Steve Bannon, calling him "Sloppy Steve." "I authorized Zero access to White House (actually turned him down many times) for author of phony book! I never spoke to him for book. Full of lies, misrepresentations and sources that don’t exist. Look at this guy’s past and watch what happens to him and Sloppy Steve!" he wrote. Trump's legal team sent a letter to author Michael Wolff and publisher Henry Holt and Co. Thursday demanding they immediately "cease and desist" from further publication or dissemination of Fire and Fury: Inside the Trump White House. The book features scathing remarks about the president and his family from Bannon, Trump's former campaign chairman and chief strategist, as well as other anecdotes and quotes from White House figures depicting an incompetent and ramshackle Trump administration. Wolff said his book is based on hundreds of interviews and months spent embedded in the West Wing as a figurative fly on the wall. Trump released a statement earlier this week blasting Bannon as having "lost his mind" and downplaying his significance to the campaign and administration. Trump also expressed frustration Thursday with the "Fake News Media" over not covering the booming stock market, writing it, "barely mentions the fact that the Stock Market just hit another New Record and that business in the U.S. is booming…but the people know! Can you imagine if "O" was president and had these numbers – would be biggest story on earth! Dow now over 25,000." The Fake News Media barely mentions the fact that the Stock Market just hit another New Record and that business in the U.S. is booming…but the people know! Can you imagine if "O" was president and had these numbers – would be biggest story on earth! Dow now over 25,000. This entry was posted in Politics and tagged Donald Trump, steve bannon, Trump Administration. Bookmark the permalink.